Collen had a really lousy day today. I noticed that he had been fussing with the area below his tail quite a bit during the last week, and when I looked, it looked a bit swollen. Normally they take care of that when he goes for grooming, but I didn’t want to wait that long, so on Tuesday, I took him to the vet. The doctor said he was pretty full, expressed the glands, and Collen seemed to be feeling better. The next couple days, however, he seemed to be even more focused back there, and was obviously in some distress, so I took him to the vet again today. His glands were fine, but the vet noticed a raw spot on his tail. Apparently when the glands were bothering him, his licking and fussing was directed at the tail as much as his rump, and he wore it raw. Collen was very unhappy as they shaved his fur around the affected area and applied some medicine. The poor dog was about ready to come out of his skin. As soon as we put him back on the floor, he went right for the spot again, so on went a cone collar. He has to take antibiotics and steroids for a couple weeks, and the doctor says that when the steroids kick in, he should start leaving the spot alone. Until then, though, the cone stays on. Since he returned home, Collen has alternated between sulking/moping/pouting and bumping into everything. Plus he can’t get to his food or water dishes easily, so I’m feeding him by hand and giving him water from a cup. The things I do for my little baby. 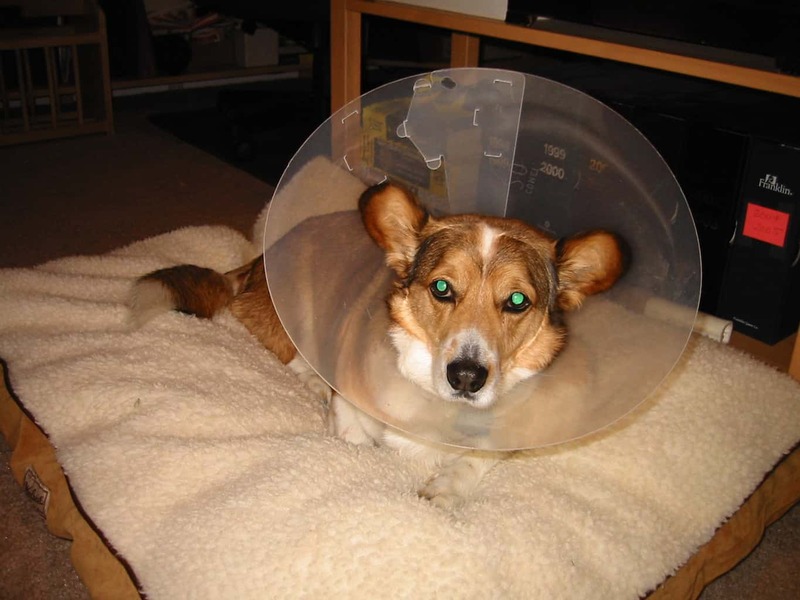 Here’s a peak at Collen and his cone collar. Poor guy looks like he got stuck in a lamp shade.